2017 brings a close to our 50 year anniversary celebrated in 2016. The Literacy Center has many accomplishments for the past fifty years, our students have accomplished many goals but our work is not done. Our community has over 18,000 adults who struggle with reading, so we still have work to do this year. Our tagline has changed over the years from, “Each One, Teach One” to“From Here You Can Fly” to our current “Read for Life.” All of these lines still apply to our vision for the past 50 years: we believe that each and every student can reach their goals and truly read for life and be self sufficient. We are excited to start the New Year and we want YOU to be a part of it! 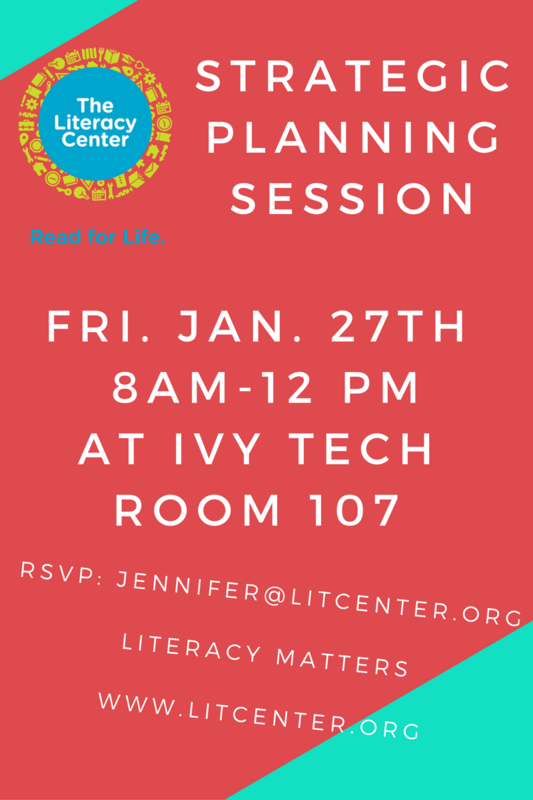 Will you please join us and be a part of our strategic planning session on Friday, January 27, 2017 at 8:00 am-12:00 pm at Ivy Tech Community College Room 107. Respond attendance by email. If you can’t join us you can still provide input by completing our survey at https://www.surveymonkey.com/r/2569TMB.